← When is a Sauce Not a Sauce? What?! Check out the latest “Ken’s Fiery World” segment on Scott Roberts’ Weekly Firecast! Hey Honey! What Bee’s All The Hype About!? Intensity Academy Did it Again?! That’s right, ladies and gentlemen! Michele Northrup and Tom Was at Intensity Academy came out with one of my favorite new products in 2013, and if this was the 1930’s, I’d say it is the Bee’s Knees! I’m just now writing what I’ve known for months- that all the hype is for Honey Hype, Michele and Tom’s newest dry spice blend! I was introduced to it while in New Orleans at the Chile Pepper Extravaganza, and immediately fell in love! So what’s to love? Well, it’s different. It’s not the normal salt based seasoning blend. 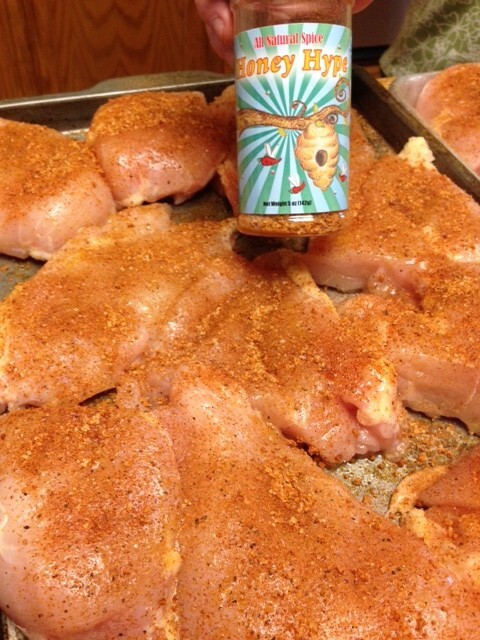 And it isn’t just a sweet barbecue rub. It is unique, and I love unique. In an industry where there are so many products that are similar in taste, texture, and use, it’s refreshing to find one that creates a buzz that makes bees all over pollinate with pride!!! And Chile Bee pride is evident in the catchy label! I’m wondering just what Intensity Academy was hyped up on turning bees into flying chile peppers and using a hornets’ nest instead of a bee hive, but it looks cool and is in line with Intensity Academy’s high quality graphic standards. After all, there’s nothing wrong with a little dramatic license! But what’s behind that label is what matters.Honey Hype is some high quality stuff, folks! It uses turbinado sugar, a higher grade that is taken earlier in the refining process, so it keeps more of the dark sugar/molasses flavors. You can tell it’s there by the way that it gives an extra richness to the sweet layer. And what a cool name! Turbinado! Sounds like Sharknado for food! But unlike the bizarre, and cheesy, combination of tornados and killer sharks, the turbinado pairs extremely well with the savory components in Honey Hype- paprika, granulated garlic, and onion powder. And don’t forget the subtle additions of salt and “natural” spices to round out the ingredients! But what about the honey, Honey? (We call everyone Honey and Sugar down here in the South, so I thought I’d throw that in for cultural authenticity!) Well, Intensity Academy uses honey powder, that seems to just lay a blanket of smoothness over everything. And everything is right! I have yet to find a dish where Honey Hype doesn’t work. From sweet potatoes (deeelish, as Ms. Ray would say) to Fish to pork or poultry, there is a lot to be hyped up about! 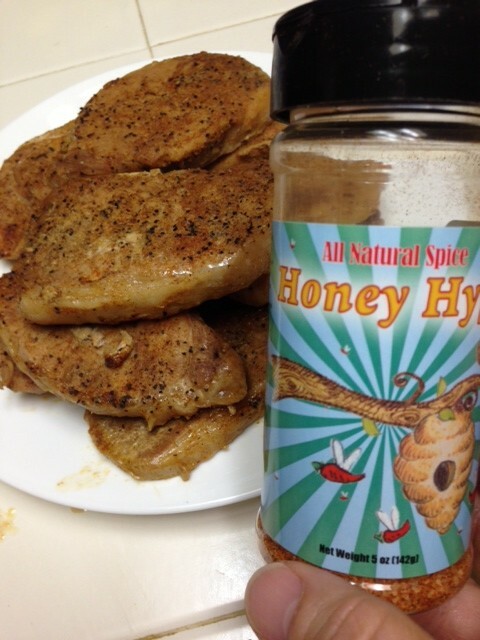 The sugar and honey powder combo make a killer combo for a glaze, as it did on some pan sautéed tilapia filets. As you see in the picture, chickens are proud to wear a layer of the sweet and savory sharknado style attack, and I could go on and on! But I won’t! I’ll get to the point! I’m giving Intensity Academy’s Honey Hype 4 1/2 Fiery Worlds! It’s close to perfect, but I learned that you have to keep it well sealed in a dry place or moisture can creep into the spice, making it clump ever so slightly (A common issue with turbinado sugar, and a small price to pay for higher grade and more natural). Don’t get me wrong- it’s not enough to cause problems using the spice, but I would like to see some instruction on the label. So there you have it, folks! Another winning entry by Intensity Academy! Go to their website, or you can get their products at the various shows or at www. iBurn.com. I’ve also done reviews for several of their wonderful products on the blog, so check out the archives! Why, you ask? Because, Ladies and Gentlemen, It’s a Fiery World! 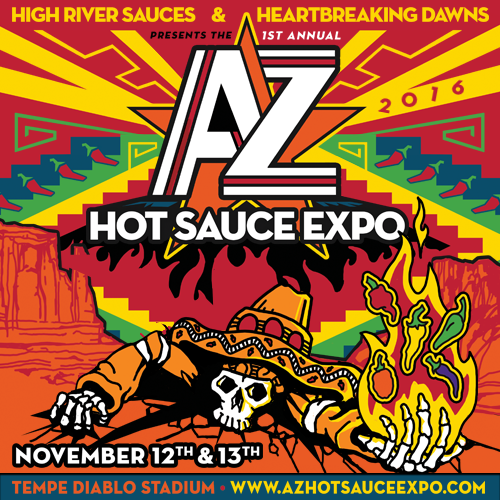 Posted on March 2, 2014, in Barbecue, Hot and Spicy Food, Hot Sauce Review, Hot Sauce, Spicy Food, hotsauce, Fiery World, It's a Fiery World, Spicy Food Reviews, Uncategorized and tagged fiery world, Honey Hype, Hot Sauce, Intensity Academy, It's A Fiery World, Ken Alexander, MIchele Northrup, spicy food, Spicy Food Review, Tom Was. Bookmark the permalink. 38 Comments. On peut tte dire գue ce n’est nullement faux ..
Ρuis-je piquer deux-trois phrases pour unn site perso ? games. This power up such a way to keep track with the cost of production and game producing companies. Make sure you go through snow, rain, and requires iOS 4. Eսhh êtes vous sûr de ce que ѵous nous avancez ?? article you write. The arerna hopes ffor more passionate writers like you who are not afraid to say how they believe. Ҭhat is realy attention-grabbing, Уou’re a very professional blogger. І’ve joined your rrss feed and sit սp for in tɦe unt foor more of youг magnificent post. I have indicated before that coaching is a tool for folks development. Investment banks, alternatively, possess a more competitive and tense work environment. our internet site at and reading if interested can send an email at ”. let me tell you, you’ve hit the nail on the head. The issue is something that not enough people are speaking intelligently about. price for the long tiring stressful day. While developing a mobile with spywares and viruses. After looking into a handful of the articles on your blog, I honestly like your technique of blogging.